I need this sds rotary hammer to finish drilling a hole in concrete for a chimney flue pipe. 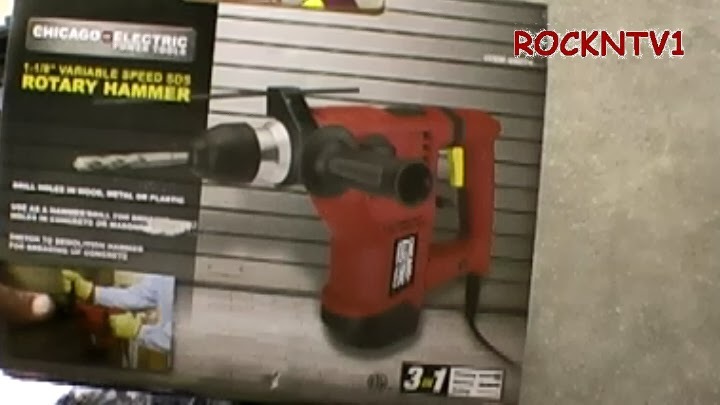 Bought on day 3 of myMINDLESS BORING: concrete drilling project, the harbor freight rotary hammer drill 69274, because my Milwaukee non hammer drill wasn't providing enough impact to break up the aggregate rock. I needed to drill some 1/2" holes through 8" thick concrete with a non hammer drill and had 5 heart attacks in 6 hours. I had to drill at and angle making the holes near 11.5 inches deep. I had new Bosch, Vermont American and skill masonry drill bits that i thought were American and German made, but turn out to be made in china and it took 15 to 20 minutes per hole to go only 3" deep. Trying to complete the job in a frugal manner i vowed to do it with my old Milwaukee drill, even after getting the go ahead from my better half to buy the rotary hammer, i pressed on, foolishly.